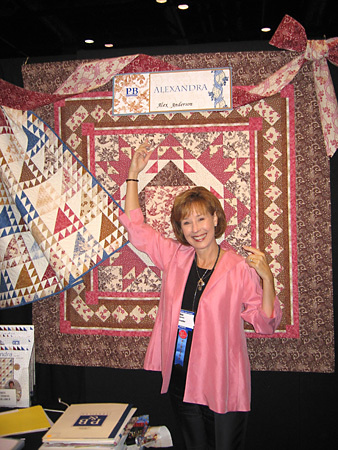 The Alex Anderson Quilt Connection podcast is dedicated to inspiration, education and growing today’s quilting community. 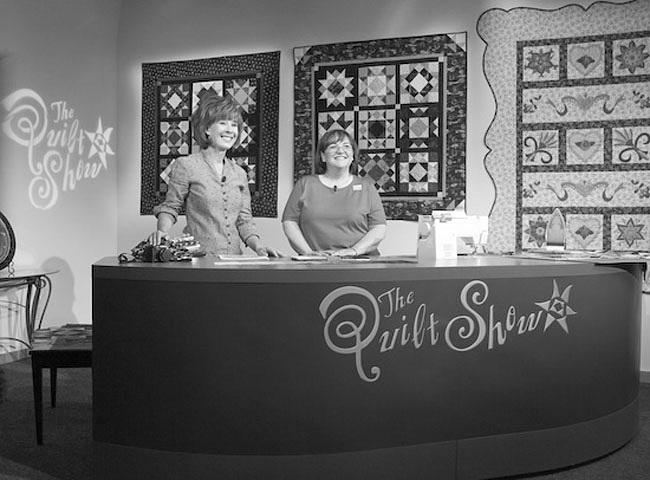 Segments will include quilt related topics including, instruction, events, interviews, questions and answers and much, much more. Either listen to the show from this page or subscribe so your shows are downloaded automatically (what’s this?). Either way, we have a lot to share and invite you to join us! 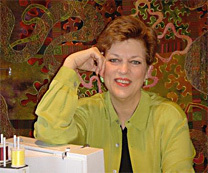 In this episode Alex interviews, Donna Sue Groves, who is not a quilter, but certainly has made her mark in the world of quilting of which millions delight on a daily basis! 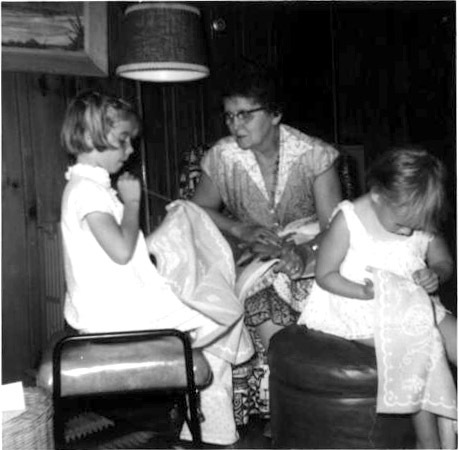 Alex interviews a daughter of a quilter – her daughter. 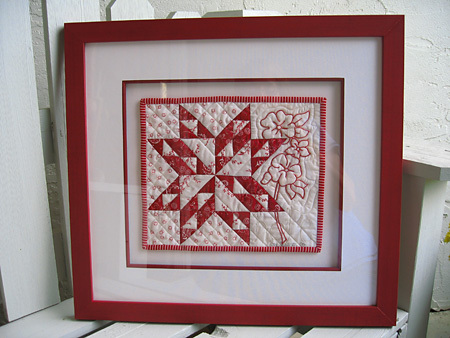 Also in this episode we celebrate our listeners by giving a free red work quilt pattern starting on Dec. 25th, so pass the word along! This past holiday weekend was so much fun and frankly continued my growth with technology. From podcasts to paper piecing, life is a bowl of challenges – and the question is, what is the next challenge that you plan to meet? Some of the many things for which I am grateful. 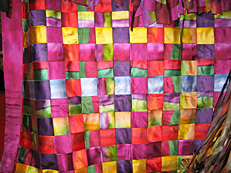 I am always amazed where my quilting journey takes me – in this case, San Jose, Costa Rica! Both John and myself fell in love with the country and it’s people – we even found purselves rooting against the U.S. in favor of Costa Rica during the Soccer play offs – oh my! They asked and you voted. Wow – I was surprised by the results – especially the first vote! Then reflections on the fantastic folks who are teaching and inspiring us world wide! 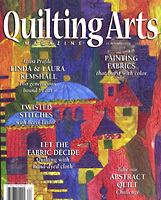 Quilter’s Home magazine checks out my house! Jinny Beyer is truly a jewel in the crown of quilters today. She has paved the way and continues to do so with class, style and incredible talent. 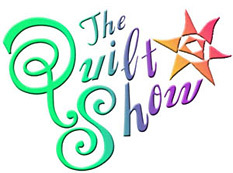 Do not miss this show – join www.thequiltshow.com today! I often wonder how can quilting get better and it does – every year! Here is a small retrospective of the activities this year from this quilters point of view.Also, here is a glimpse of the special exhibit that I was SO worried about. Quilts, Inc. did a bang up job! Thank you friends!! 30 Years and Still Quilting! Wow – when you think about it – that’s a long time – with history to boot. 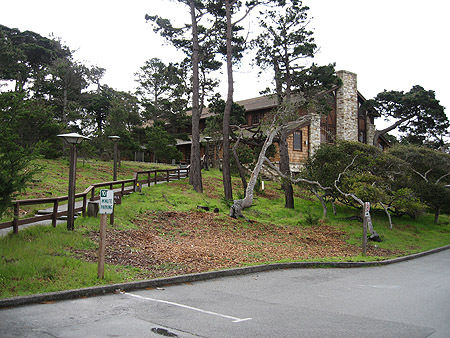 During this episode, I go WWAAAAYYYY back and recount what was going on in the San Francisco Bay area during the early renaissance of our industry. Who knows where I will end up next? Last week it was the east coast – at least for the most part and now it is time to travel off to Houston. 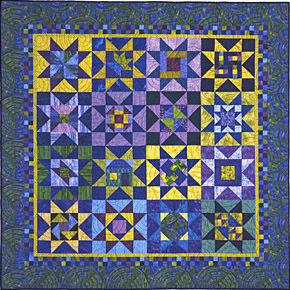 For those interested in attending my Simply Stars class in Livermore contact Cyndee at cyndeec@aldenlane.com or feel free to call 925-447-0280. The dates are January 21 – 23, the cost is $250.00 including lunch. And speaking of food, can you believe I ate the whole thing??!! 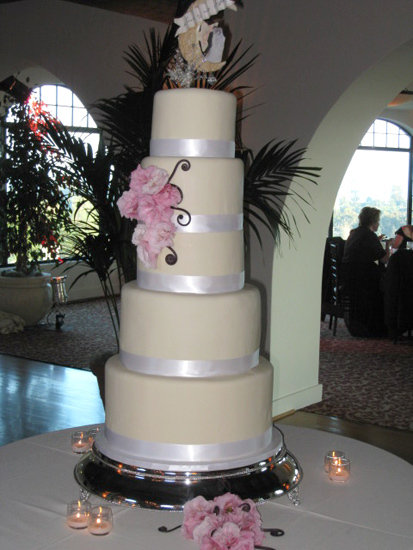 NQR – but who can resist a wedding? This summer has been a whirlwind of activity, and perhaps the high light was Joey and Shelly’s Wedding. 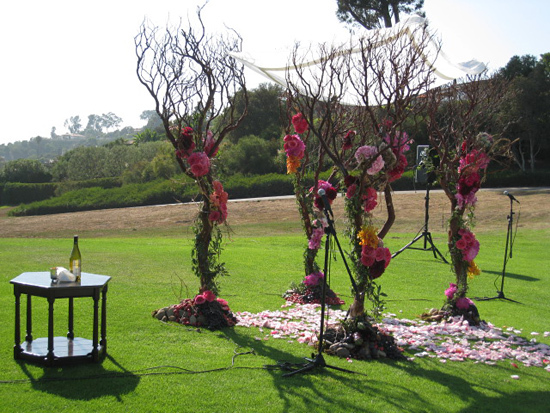 they met at UC Santa Barbara, so it was only natural that the event was there. Here are a few pictures snapped that day by me, but for a video review go to www.dvartistry.com – then go to the blog section and scroll down to August 17th. 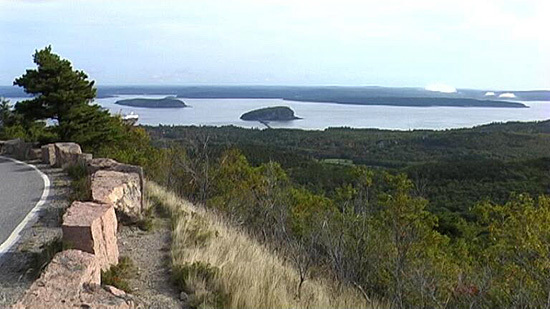 This video was shown at the conclusion of the evening. 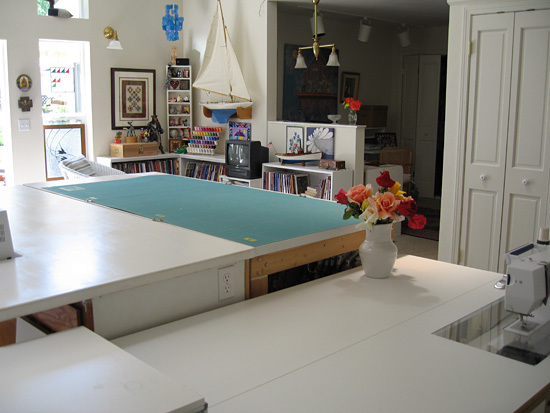 It is way past spring cleaning time for many of us – if you find yourself in this position, here are some great tips and tricks from TQS members. What is your favorite tip to keep organized? 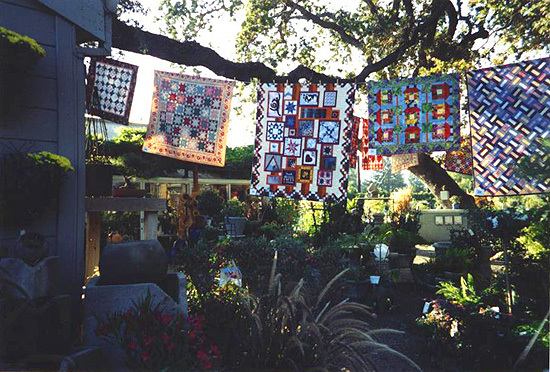 It seems that all quilters learn to claim their space. 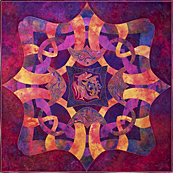 Some have better situations than others, but non the less, were ever we stitch, becomes sacred territory – What is your space like? 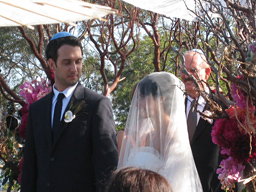 Recently I had the delicious opportunity to work with my friend Wendy Grande – www.grandedesign.com – preparing a chuppah for my son’s wedding. 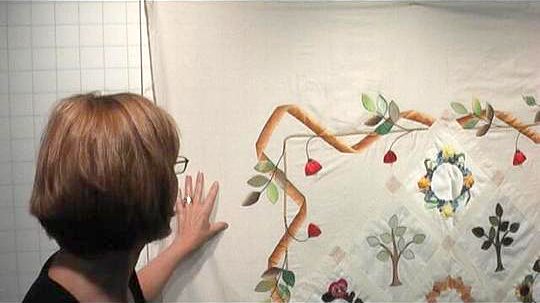 In exchange I worked out the quilting details for an incredible piece she is working on. 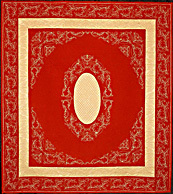 To see video blogs visit www.thequiltshow.com and start on May 31, 2008. Back from NY and off to market – just how do we professionals get time to quilt? 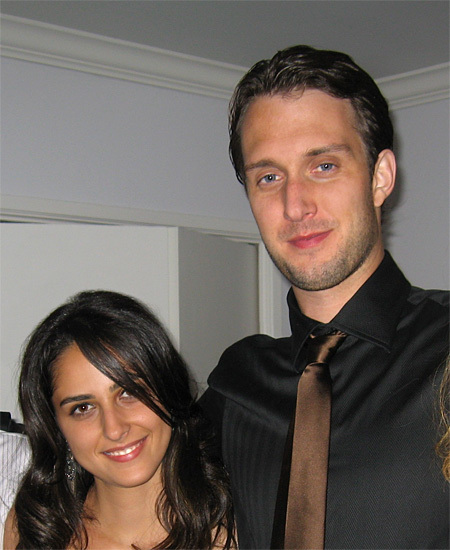 It is not easy, but we do! Please visit Annie Smith at www.simplearts.com to listen to her podcast! Let’s hear it for Paducah! What a week it was. 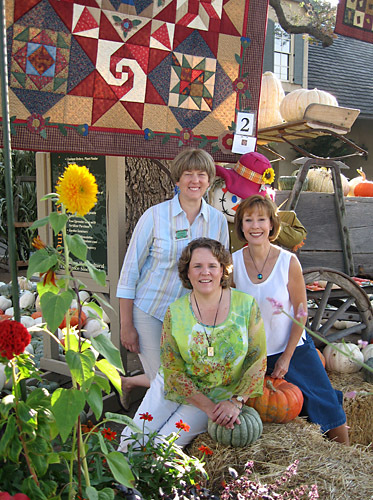 From award winning quilts to fun and games – here is a recap of a WONDERFUL week! 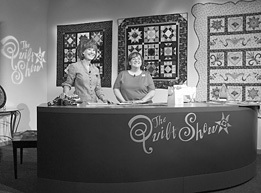 The quilt show launched its first T.V. 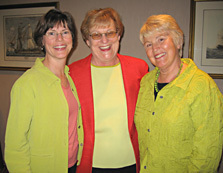 show just a year ago from today – oh my how we have changed and grown. 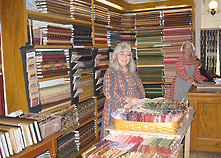 Join Alex and Ricky for a crack of dawn phone conversation – I’ll take my coffee black, please!To check us out please go to www.thequiltshow.com. Man oh Man what is all the fuss? We are missing 1/2 our population – let’s go for it!!! 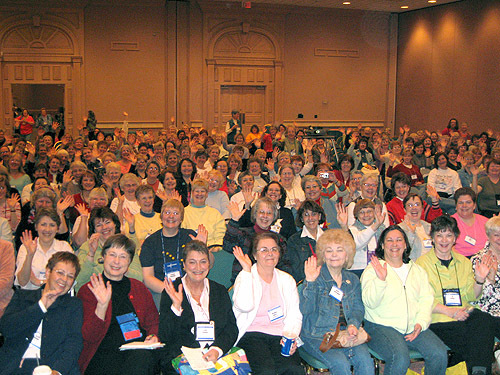 Ladies – it is time to grow the market. 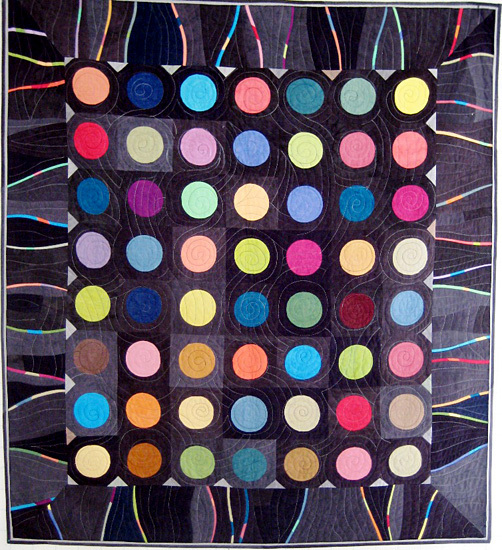 This quilt is Controller Dream – which by the way was designed by my husband. 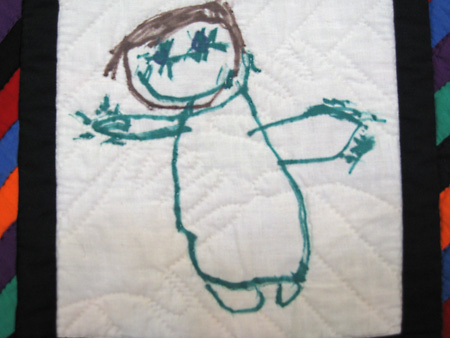 Creativity comes from everywhere – it is simply a matter of opening your self up to opportunities to grow – charting my past 18 month unusual growth pattern. 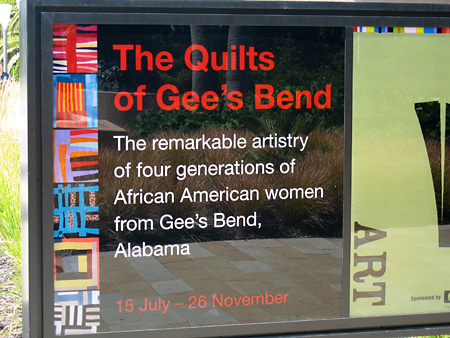 The next two months appear to ditto the expression – “A rolling Stone gathers no moss” – I will be crisscrossing the country and look forward to meeting you! 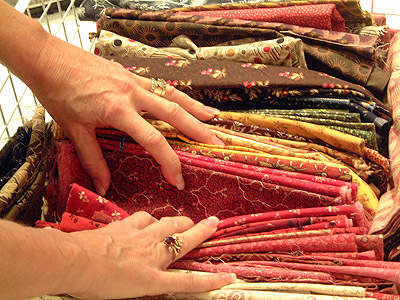 Listen up – it’s all about how you handle you fabric once it has been purchased. Tips from a textile manufacturer, P&B textiles, for the care and feeding of fabric. Is that kind of like apples and oranges? 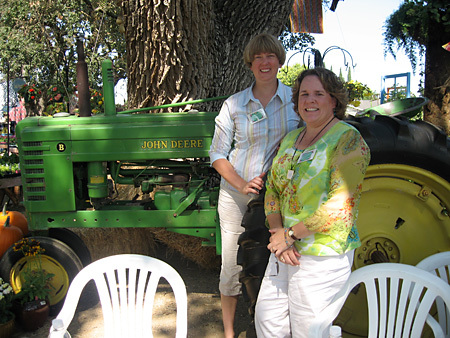 sort of……I bit into green this past weekend – apple, that is. Computer woes turn into a new adventure. 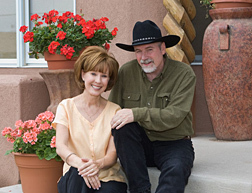 Also, if you are attending Paducha this year, come a few days early and attend the Super Seminar with Ricky, lLibby and my self – we would love to see you there! Visit the AQS website (www.americanquilter.com) to sign up today. 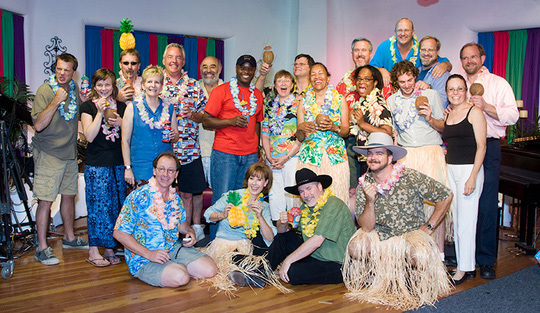 Here we go – it is the end of the year! The tree has been trimmed, the presents wrapped and all is calm. 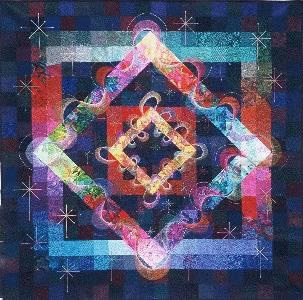 As the year comes to a close, I take a moment to pause, quilt and celebrate what is coming up next! For one thing – check out this quilt by Sue Garman – This is going to be The Quilt Shows block of the month for the year 2008. Many more cool stuff for the year 2008! It’s all about a healthy stash – and neutrals may well be your most important player. 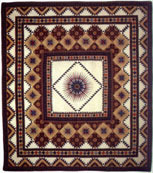 Learn the basics of collecting neutrals and enjoy their many benefits. 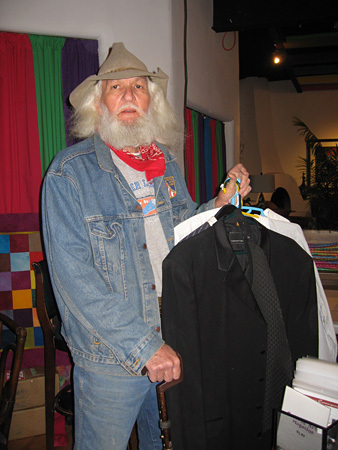 Clean out the old to bring in the new – With the holidays around the corner, what are some great gift ideas for YOU and / or to give? 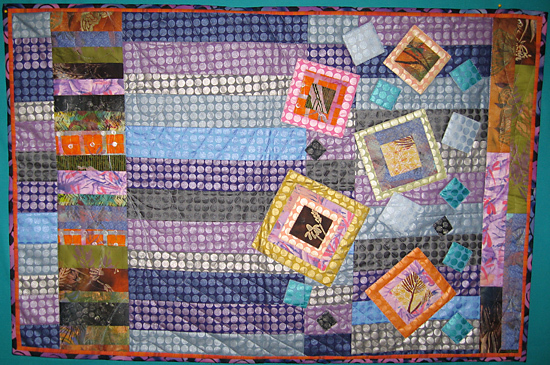 I share some thoughts regarding quilting “stuff” I love. 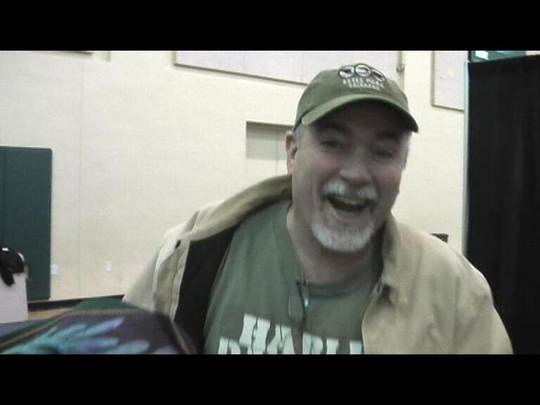 Whoops – I goofed up :0) – Michael JAMES is the 2007 Silver star winner – Congratulations to a super star winner! 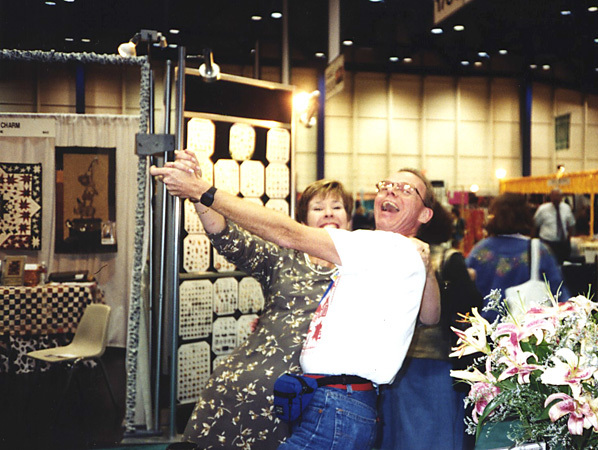 Back from the Houston International Quilt Festival – getting normal life back in motion. Check out www.quilts.com to see this year’s winning quilts at the festival. 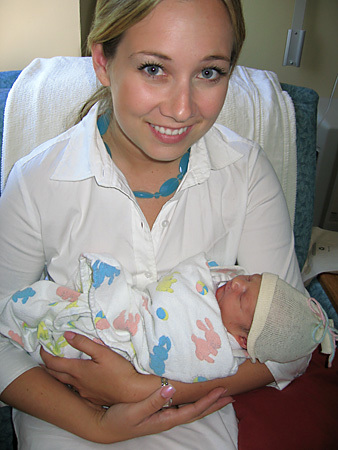 Welcome dear Shelly to our family – you are a keeper! 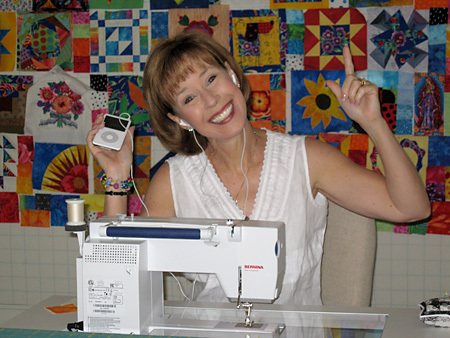 Annie Smith – Our quilter’s podcasting sweet heart spends some time with us. 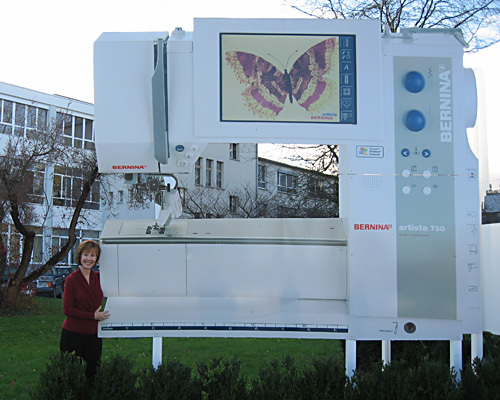 Annie shares her interesting technological and quiltie life journey with us. 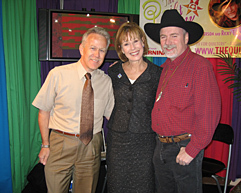 Please visit her website at www.simplearts.com to listen to her vast array of podcasts – Also to see if she is going to be in your area soon! 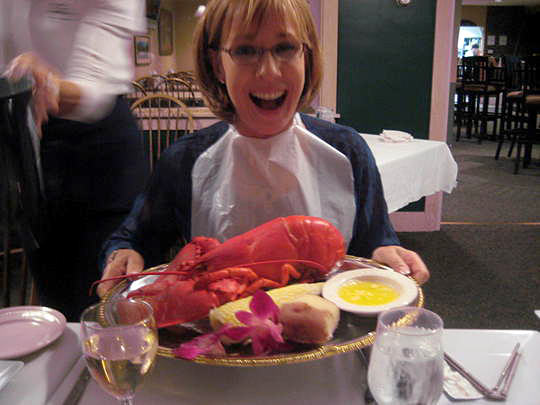 This fall has been super busy – On the Road Again doesn’t begin to express things. 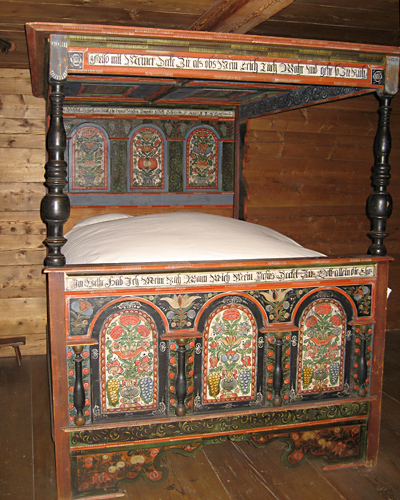 Home safe and sound for a few days, episode 68 is a madcap recap of the past month. 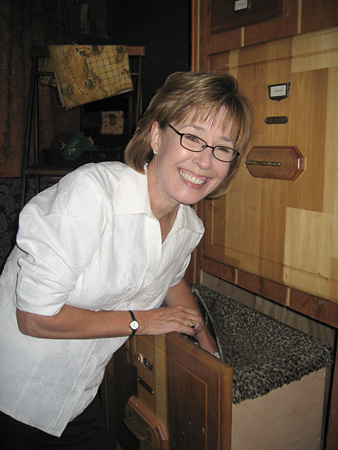 Meet Jan Grigsby Director of Acquisitions at C&T Publishing. 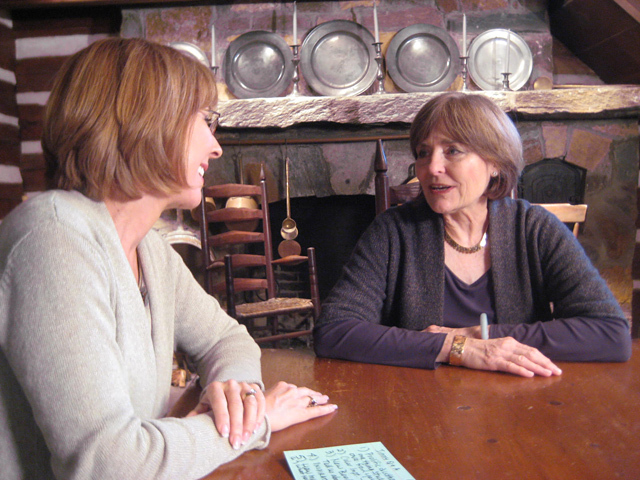 Jan explains the inns and outs of working with a publisher versus self publishing. 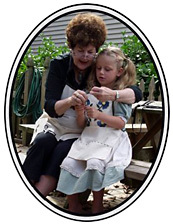 Please visit C&T’s site – it is a great place for inspiration and education. 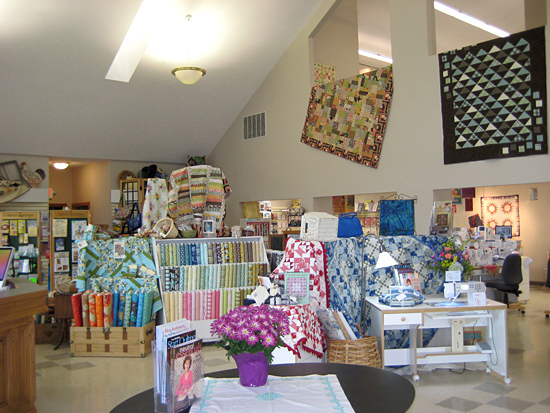 So you want to open a quilt shop? 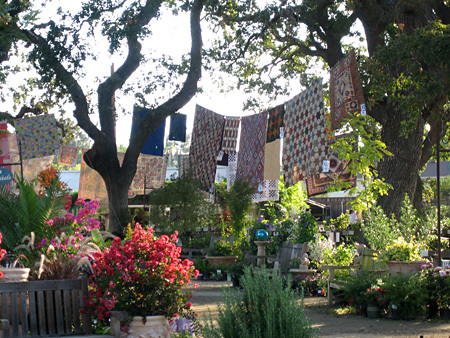 Carolee Hensley of the Cotton Patch in Lafayette CA joins us to discuss a few of the considerations a person must make before taking the plunge. 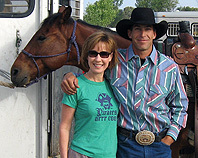 I’m back from La Veta with season 2 under our belts. 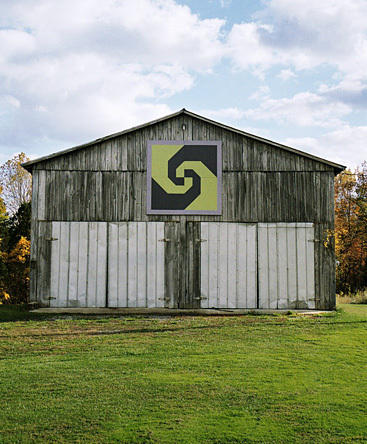 We are very pleased with the results and can’t wait to share with you. Season two will start airing January 08. 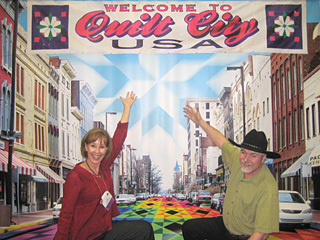 Please visit www.thequiltshow.com to see our antics. 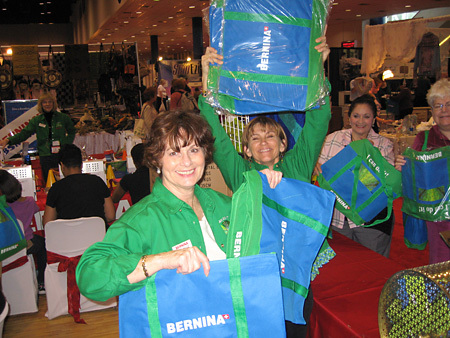 Off to Orlando for Bernina University – This is not an infomercial, just an inside glimpse of a week in Orlando. 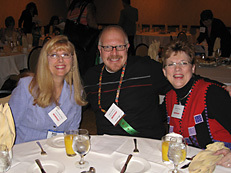 I managed to stay out of trouble – well sort of. 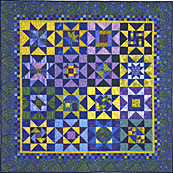 Catch up time for the www.thequiltshow.com. Back from La Veta after taping 6 more episodes – changes, changes and contests – take a listen to hear about the what is new on The Quilt Show. 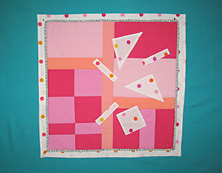 School’s out and it’s time to Quilt! 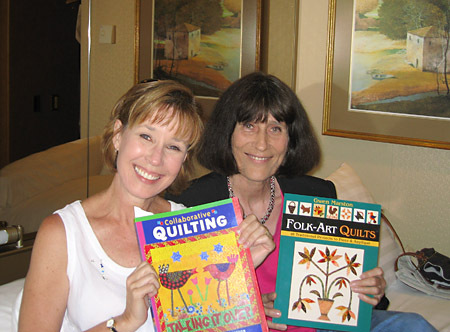 This episode talks about quilting with kids – the ins and outs of a successful partnership. May Maddness, come and gone! I hit the sky and road creating a two week adventure. From Salt Lake City to PA to Los Angeles, there is no room for moss to gather under my feet. Picture this, just how do the snap shots we enjoy in publication come to be? Elena and Gregory give us the inside scoop for the snap shot second. Do my hands look like lobster claws? Speaking of photography meet Gregory Case and Elena Morera, The Quilt Show’s Official Photographers. 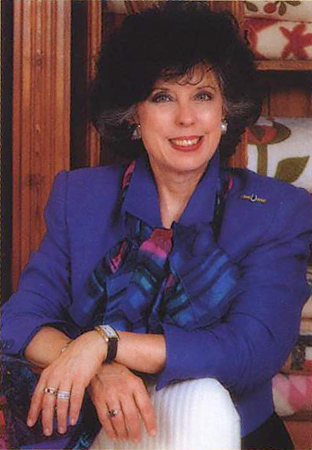 Jan Krentz – part two. 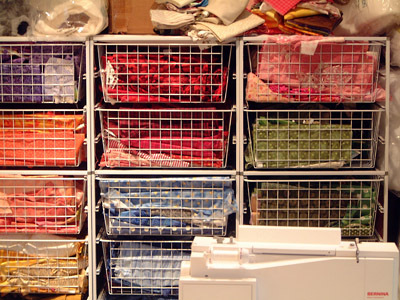 Responsibilities of a hosting guild or quilt shop. Behind the scenes of working with a national quilt teacher. 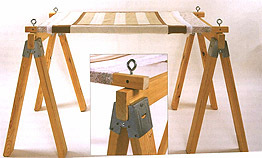 Please visit Jans’ site www.jankrentz.com to see her amazing work, teaching schedule, workshops, links and gallery. 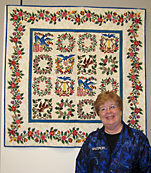 A class from Jan would be a wonderful treat for any quilter today! 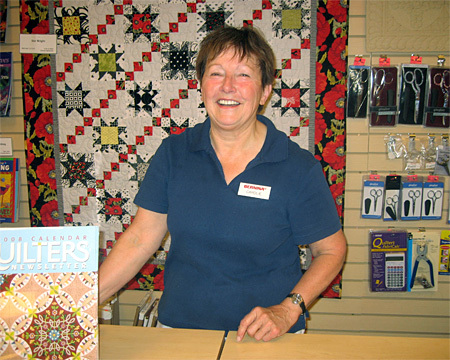 Jan Krentz spends time talking about what she has been up to, including a discussion of Quilt Teaching as a Profession. 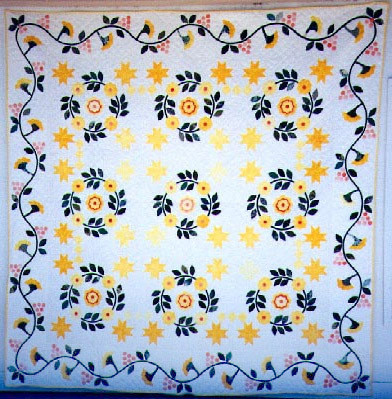 Following up podcast 55 with the eve of the taping of www.thequiltshow.com, podcast 56 is a sweet good night after the fun and furious days of the first taping session of The Quilt Show. Be sure to visit the site and check out the slideshow provided by Gregory Case, The Quilt Show’s Photo Man! Despite the hustle and bustle of the final hours before taping, both Ricky and I snuck away to recap the craziness of the last minute details. 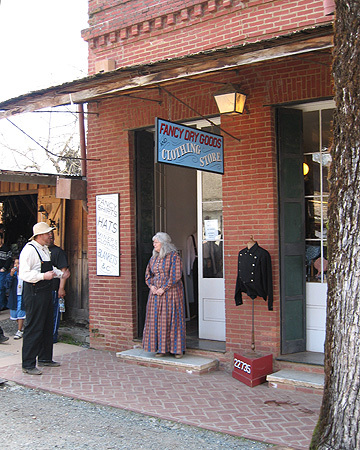 Billie, a local town icon, got in on the activity by offering Justin clothing for Bad Bart, and polished the front entry way. 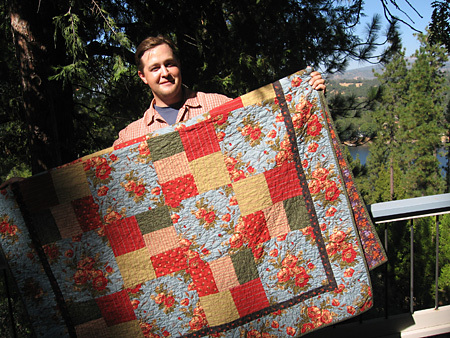 Meet Joe the Quilter, Joe Cunningham, who is not only an incredibly talented quilter leaning on traditional roots but musically a delight. The best part of quilting? You might be surprised at my answer, but then again maybe not. 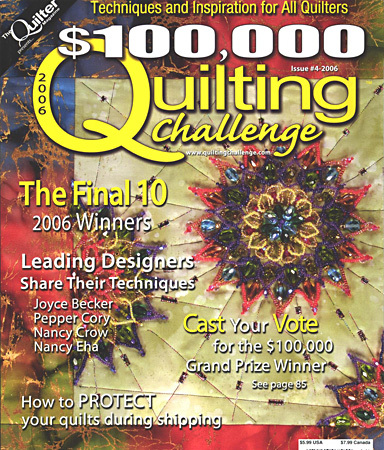 Bernina and Alex contribute to the June 2007 issue of McCalls Quilt Magazine discussing my answer. 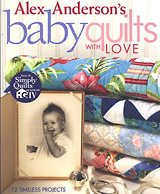 Ask your local quilt shop for a copy of McCall’s Quilt Magazine. Carolie Hensley of the Cotton Patch in Lafayette, CA, gives wise advise when purchasing a sewing machine, good stuff to think about and questions to ask. 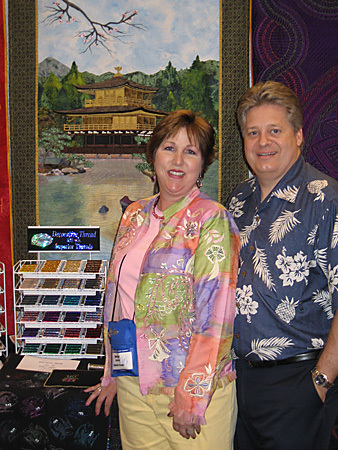 Back by popular demand, Beverly Dunivent and I steal a few moments together at Road to California Quilt show in Ontario. 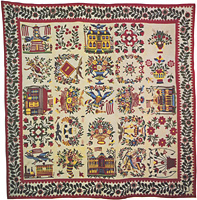 Doll Quilts are the topic of the day. 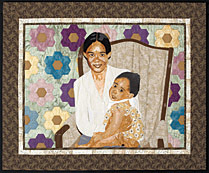 Be sure to get your issue of $100.00 Quilting Challenge March 27th to see the story of Bella and her maker Linda McCuean. 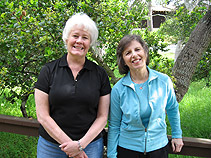 Dancing with Alligators: Loving to learn and stretching beyond your wildest dreams. It’s time to identify your alligator and step up to dance! 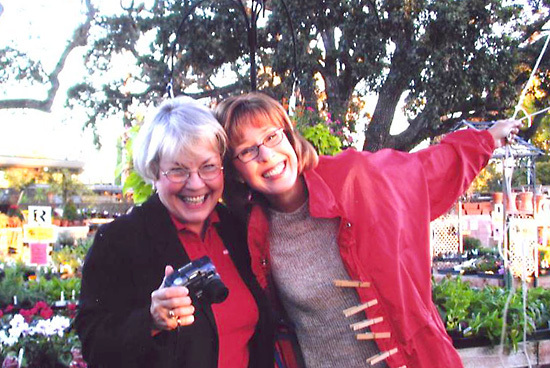 Bonnie McCaffrey and I bump into each other at the Houston Airport. We snuck away to catch up and decided to do a podcast. 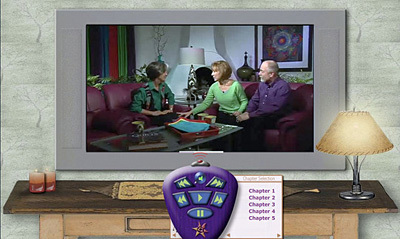 In addition, Bonnie and I did a Vidcast which will be on her site this Feb.
Bonnie McCaffrey Check out Bonnie’s technique Digabobbie, it is a fun technique and allows a lot of creative play! 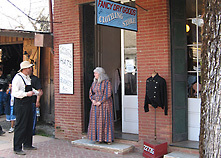 Visit her site at www.bonniemccaffery.com and remember to book mark it for our visit in Feb! Alex and Ricky Tims join forces. 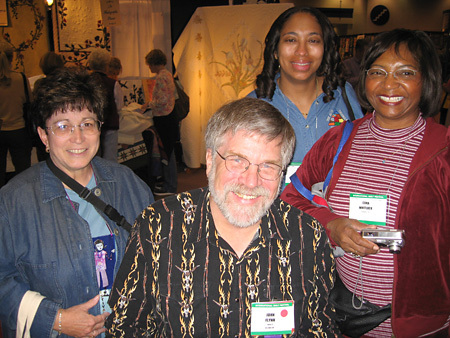 Together we are building the World Quilt Community including an Internet television Show called The Quilt Show. 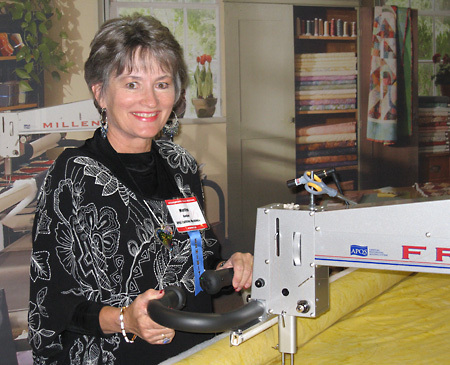 Cheryl Uribe (with APQS long Arm quilting system) joins us to talk about the profession of machine quilting, specifically how to prepare your quilt for a long arm quilter. Bernina sweeps Steckborn Switzerland with 80 American teachers. 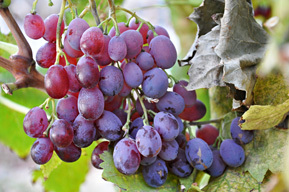 They wine, dine and deepen our appreciation for the company. 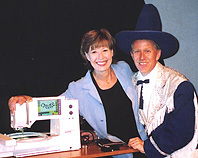 How do I love you (Bernina) let me count the ways as Paula Reid and I share our great adventure. Wow! Now I call this a sewing machine! Loving everything about the machine! 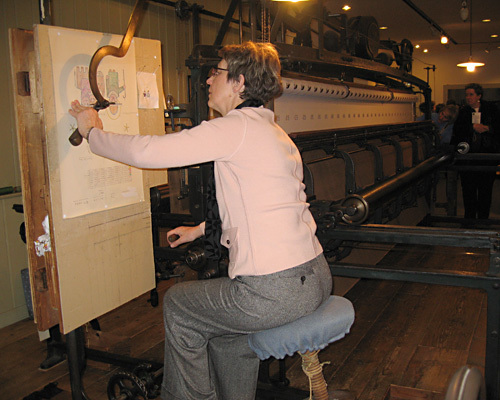 Pro extraordinar, Libby Lehman takes time out from her busy schedule to talk about needles, threads, and tension (and we’re not talking about stress induced). 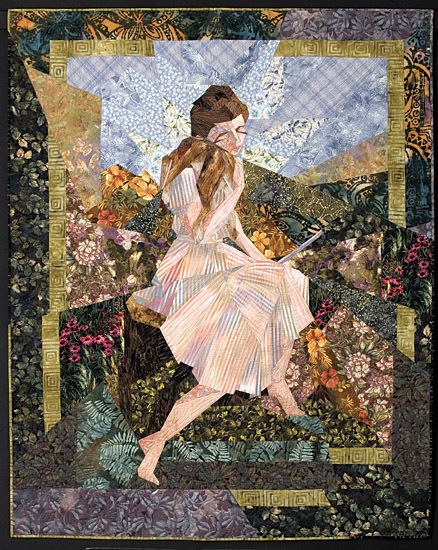 Check out Libby’s quilt Joy Ride, which was chosen one of the top 100 quilts of the 20th century along with more of her beauties. Alex and Bernina contribute to McCall’s Quilt magazine. This month in McCall’s we finish up our hopelessly stalled projects. Tips and tricks to break the block. 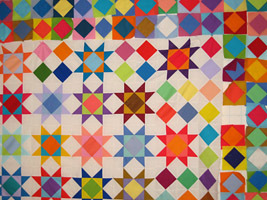 Here is the quilt (or at least a portion of it) waiting to be completed. 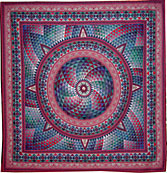 Ask your local quilt shop for a copy of McCall’s Quilt Magazine.Please visit www.BerninaInspirations.com for more information, inspiration and ideas to enhance your creative experience. 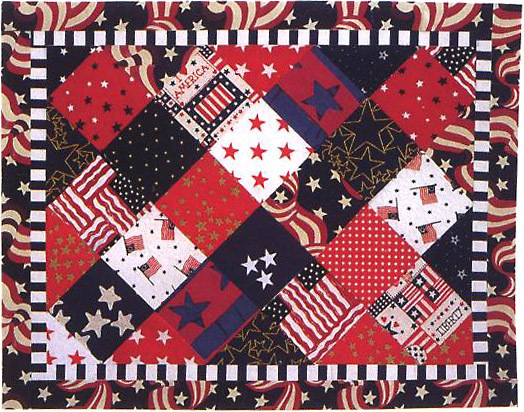 Quilting in America 2006 survey is here! 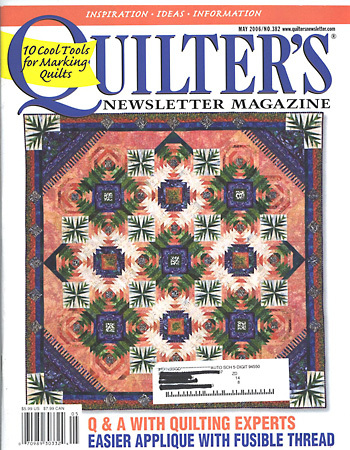 Every three years Quilter’s Newsletter Magazine and Quilts Inc. conducts an in depth survey to evaluate the health of our industry. And we are alive and WELL! 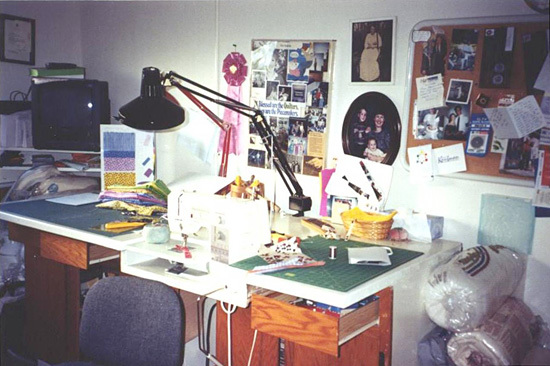 Please take a moment to tell us about your quilting habits in the comment section. I have the feeling we are probably a lot a like! 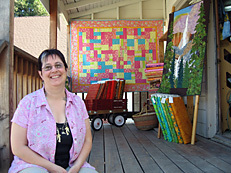 Festival was great, quilts, friends and a giant surprise. A quick update of festival from my eyes and heart. 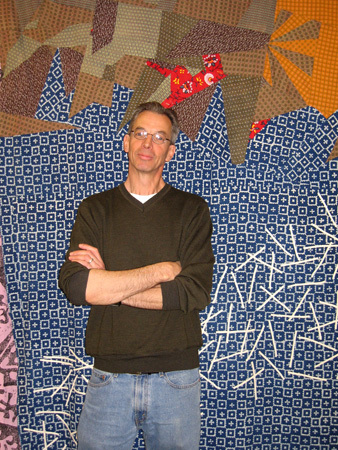 John Flynn enjoying life and quilting, one of the same! Eleanor Burns signing an autograph for a happy fan! 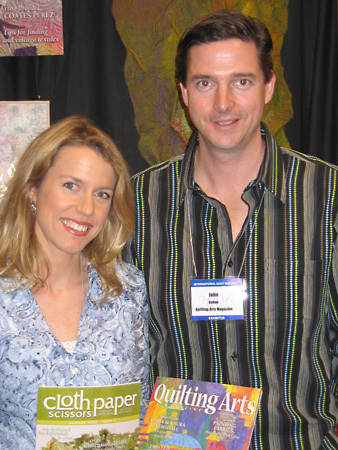 Ami Simms and myself with me priority quilts. 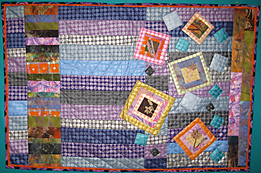 Please visit her web site and get on board with her priority quilt project, benefiting the cure for Alzheimer’s disease. Here is Bunny relaxing for a few seconds on the steps of her darling quilt shop. 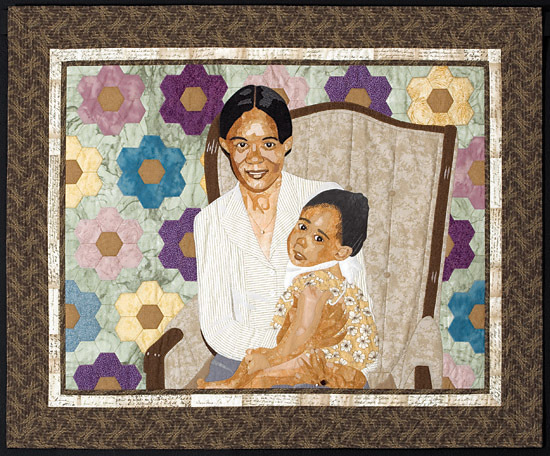 Even Bunny has her son, Ashley quilting. This is chick magnet stuff if you ask me! 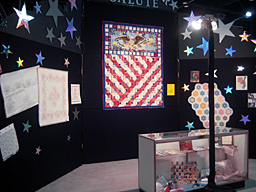 Quilt market 2006, the inside scoop. Though my visit was brief, a quick update of a whirlwind 24 hours at international quilt market in Houston TX. 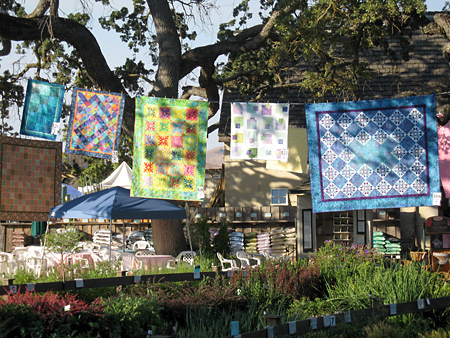 San Jose Quilt and Textile Museum struts her stuff at their annual fundraising Gala. 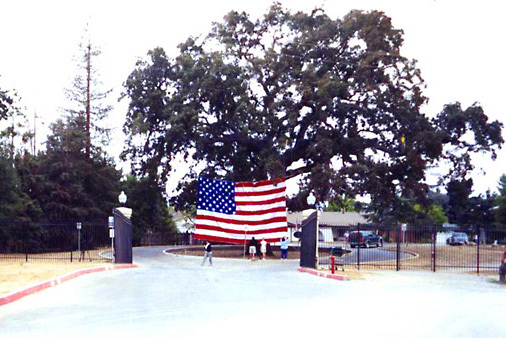 Visit the Museum at 520 South First Street San Jose, CA 95113 (they would also welcome a donation). 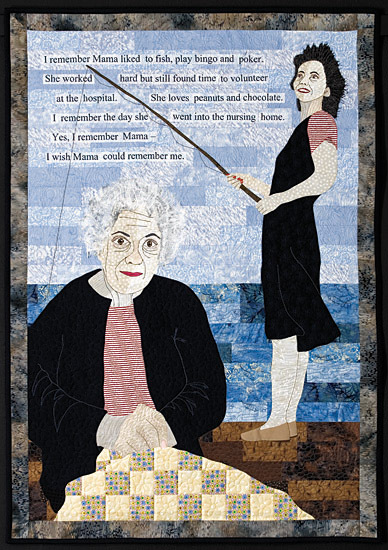 New bells and whistles on our site and an endearing visit with Karey Bresenhan (President of Quilts Inc – see episode 23) as she shares the stories behind her wonderful book, I Remember Mama. 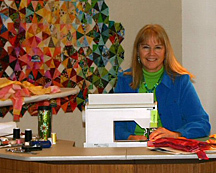 Heidi Kaisand joins us and we learn what makes American Patchwork and Quilting Magazine tick. And just how are the quilt shops chosen for Quilt Sampler? 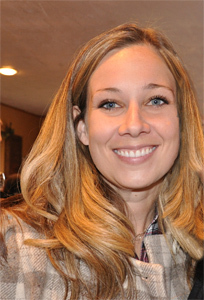 Heidi reveals all and shares her secret weapon, Laura Boehnke. 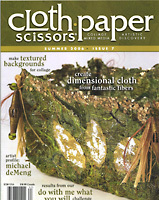 To order your subscription today: www.amazon.com/American-Patchwork-Quilting/dp/B000063XJJ. 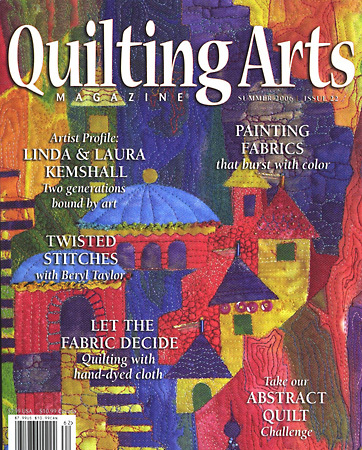 Alex and Bernina contribute to the Dec. issue of McCall’s quilting magazine. 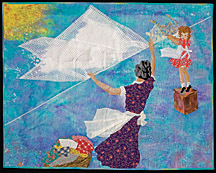 This month’s article suggests to listen to your quilts, just like children as they have minds of their own. Really?! 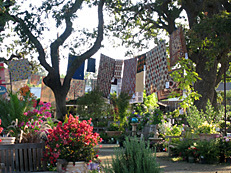 To check out Elizabeth’s work, lease visit her web site at www.latebloomerquilts.comTo check out Gayle’s store, Back Porch Fabrics, in Pacific Grove, Ca. 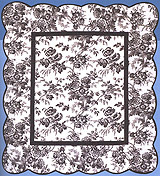 please visit her web site at www.backporchfabrics.comPlease visit www.BerninaInspirations.com for more information, inspiration and ideas to enhance your creative experience.Ask your local quilt shop for a copy of McCall’s Quilt Magazine. 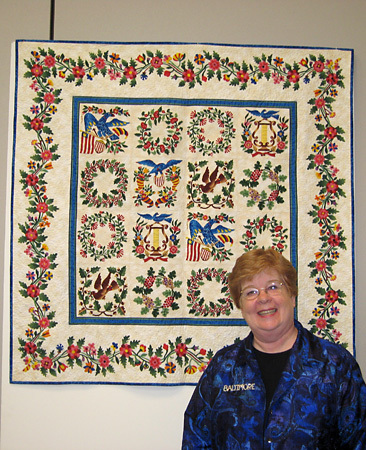 Hope – Meet Beverly Dunivent, quilt historian, appraiser and friend. 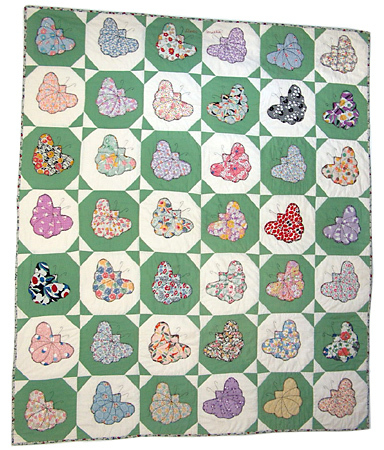 Dear Mattie is the name of this fabulous butterfly quilt that Beverly owns. 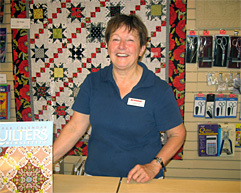 Beverly, back in the saddle and ready to quilt, teach and travel. Queen of Baltimore, Elly Sienkiewicz, joins us for a look into our nation’s history and teases us with current options to play around with. 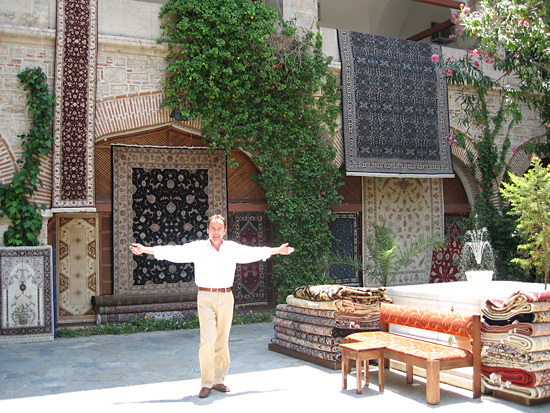 Ricky Tims invited me to visit in Le Veta CO and see his fabulous digs. Both Ricky and Justin opened the doors to their incredible Art Quilt Studio and Gallery, and let me sneak and peek in all the corners. What I found was a dream come true, Ricky’s dream is our treasure to enjoy. 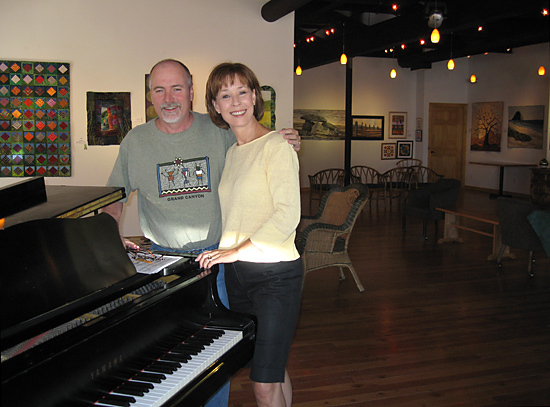 Ricky and myself after a one on one personal and private concert in the incredible gallery he has brought to a reality. 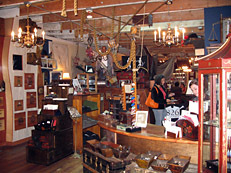 From the De Young and the quilts of Gee’s Bend to a pirate store, a day well spent with my friend Cyndee. A most excellent day with tons of inspiration and laughter. 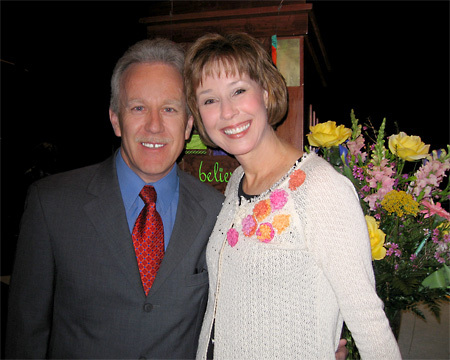 Gwen Marston joins me in the Mediterranean to chat about what inspires her, what she is doing and where she is going! Gwen also shares her passion and dedication to remembering those before us and giving credit where the credit is due, Lest we Forget. 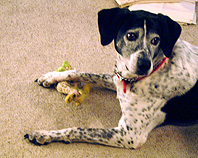 Gwen always makes me laugh and think, as I know she will for you. Gwen and myself hanging out in my cabin, showing her goods. 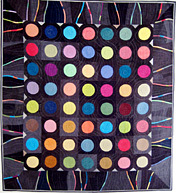 please visit Gwen’s web site at www.gwenmarston.com. 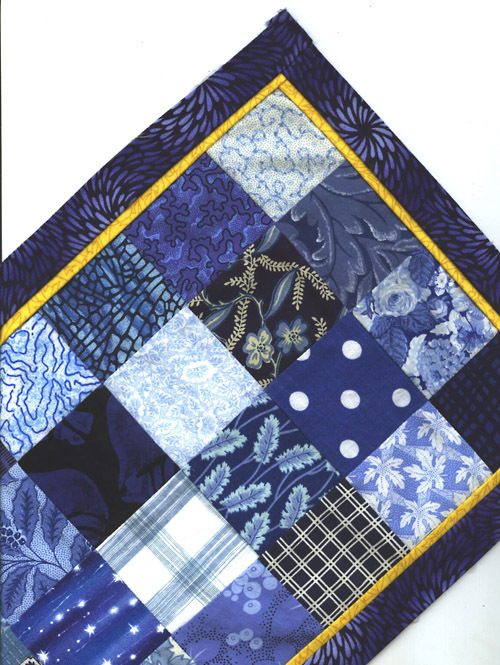 Cruising and quilting, what could be better? 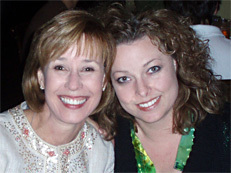 Faye Doyle and I snuck away aboard ship while sailing in the Mediterranean. 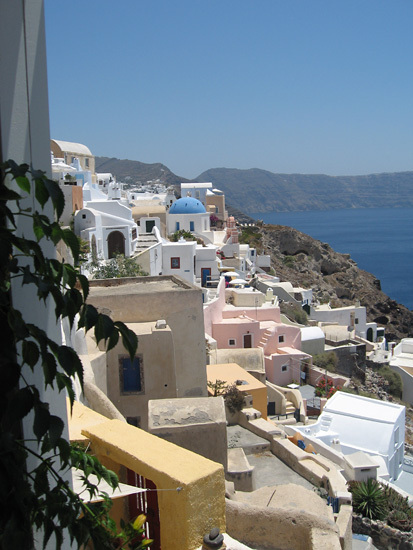 Faye explains about the ins and outs of cruising. Caution: This episode could be dangerous to your pocket book! In Turkey I managed to pass on rugs, but many didn’t. 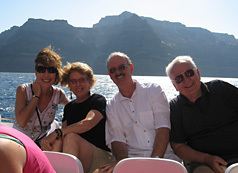 Mom, Dad, John and myself loving every minute of our quilting/cruising experience. Please visit www.quiltcelebration.com for more information about cruising with us. 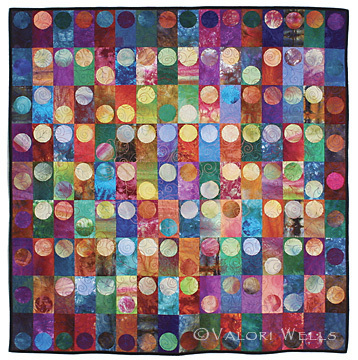 Fabric designer, author, photographer and quilter, Valori Wells shares her passion and process of designing fabric with us. 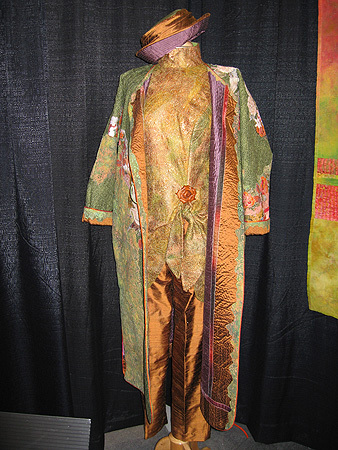 Val reveals how she weaves her artistic magic into cloth with a fresh and contemporary look for us to enjoy. 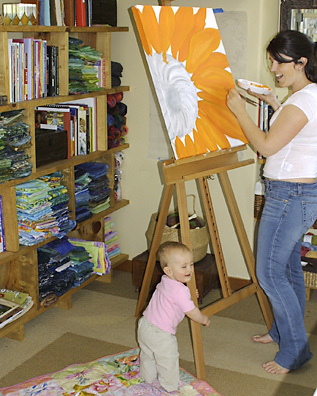 Check out Valori at work or is it play, with future artist Olivia. 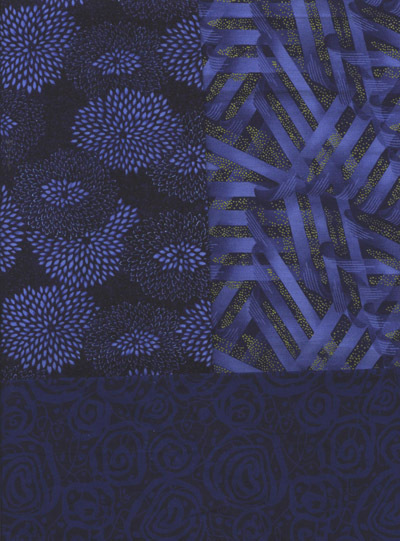 Fleurish is Val’s latest fabric line, for a sneak peek or to order your own, visit please visit her web site. 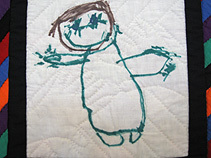 Also check out her patterns, they are fresh, cool (just like Val) and easy to make. 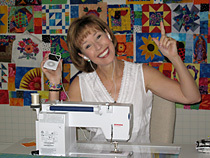 www.stitchinpost.com to see her incredible work, to shop (Book mentioned – Quiltmaking by Hand) and play with her super fun quilt designing tool. My Quilt Hero, Jinny Beyer takes time from her busy schedule to talk with us. 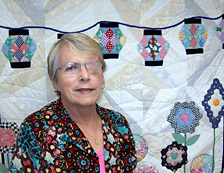 Find out what is new and exciting in her quilting life. You will be charmed, just as I have been through out the years. 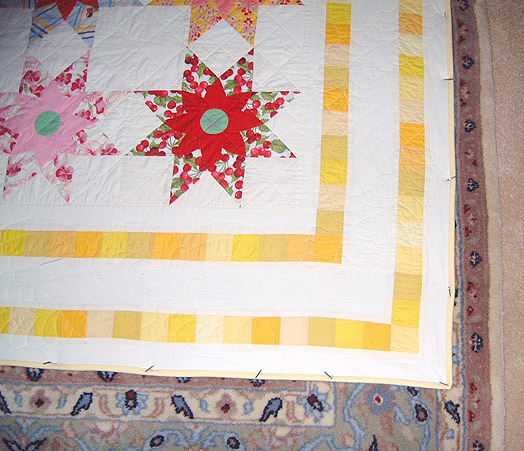 Here is Jinny’s first quilt, Ray of Light, which put her instantly on the map so many years ago. Windows was made after 911. 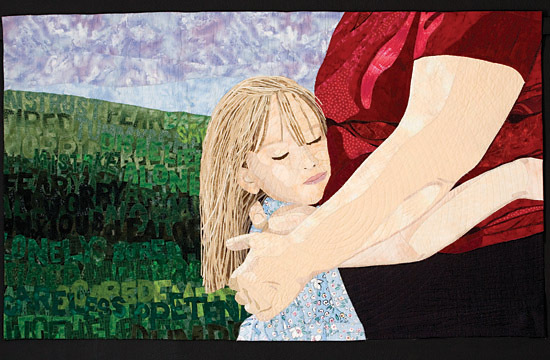 This is an incredibly moving quilt filled with emotion and story. 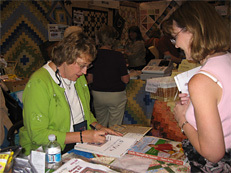 Please visit her web site at www.jinnybeyer.com to see her incredible work, to shop (Book mentioned – Quiltmaking by Hand) and play with her super fun quilt designing tool. 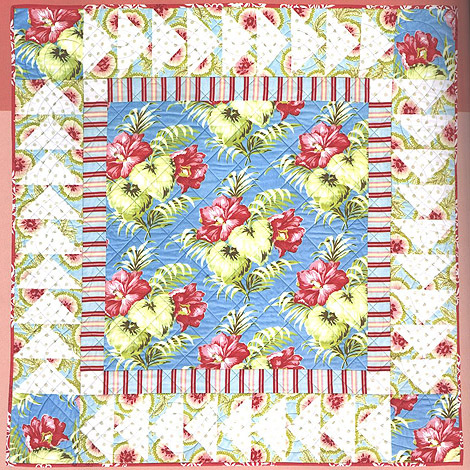 Alex and Bernina contribute to McCall’s Quilt magazine. 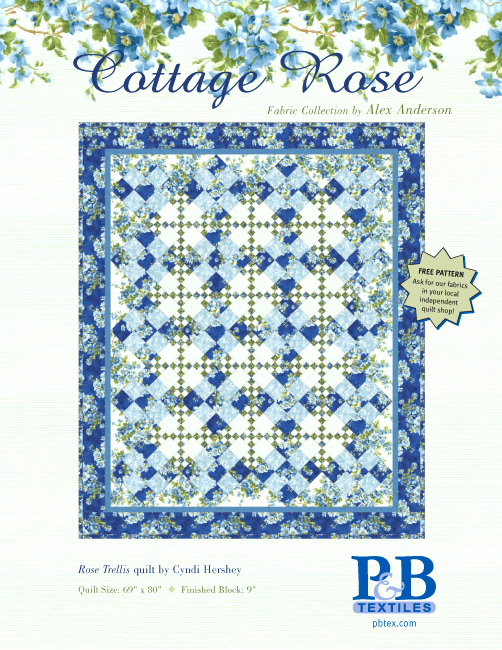 This month in McCall’s (Oct. 2006, available July 17th) we explore setting the mood for quilting. 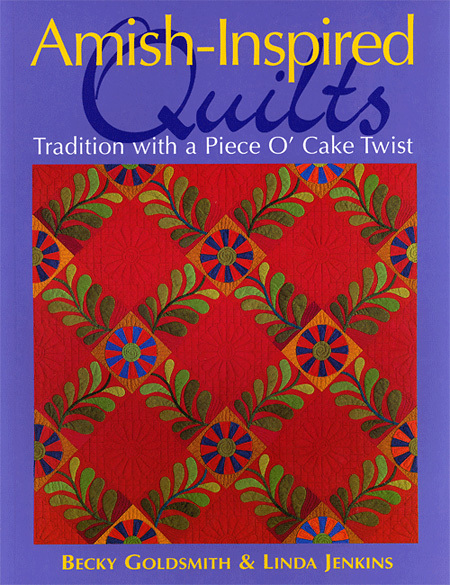 But what about getting in the mood for quilting? 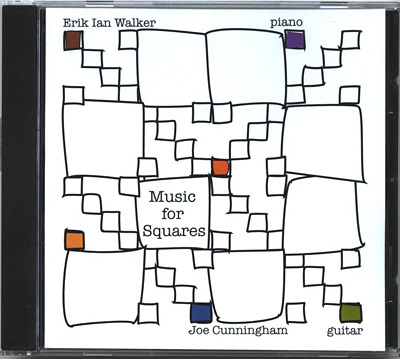 Ideas for creating inspiration and identifying your stumbling blocks. It’s all about the mood, ask any family member or close friend! 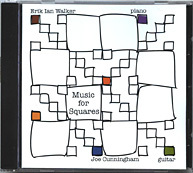 To figure out what I listen to while quilting take a peek here. You might be surprised! 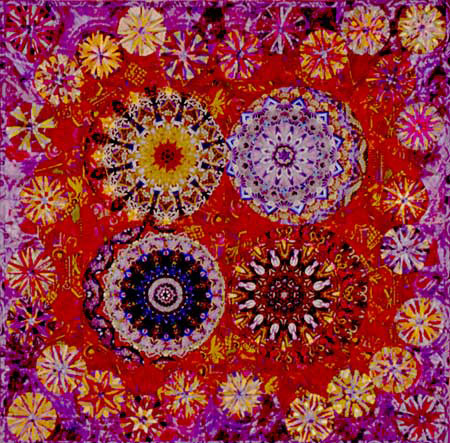 Paula Nadelstern puts kaleidoscopes in our eyes. 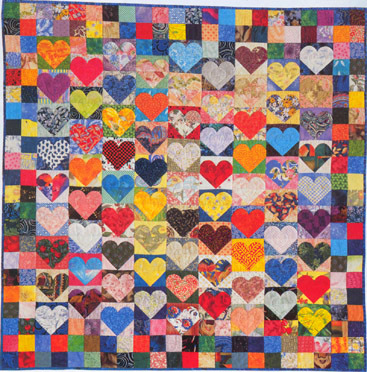 Charming, funny and New York to the bone, Paula delights us with who she is and how she makes remarkably, stunning quilts. 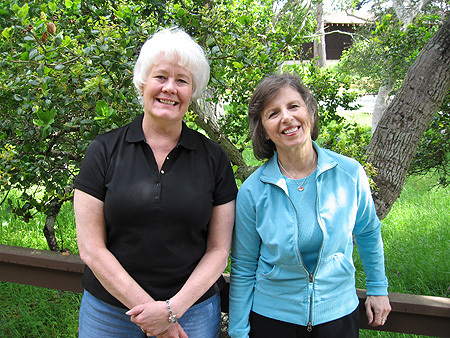 Piece O Cake’s dynamic duo tell what it takes to keep their company alive and fresh, including a friendship that is strong and healthy. 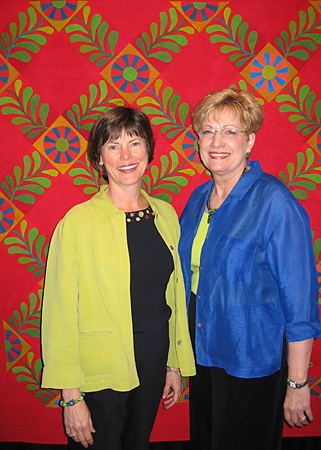 Becky Goldsmith and Linda Jenkins standing in front of the cover quilt for their newest book, Amish Inspired Quilts. Becky is on the left and Linda on the right. 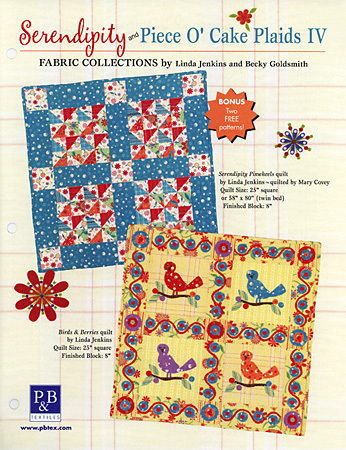 Ask your local quilt shop if they carry this fabric line and if so, they can get you a copy of this free pattern. 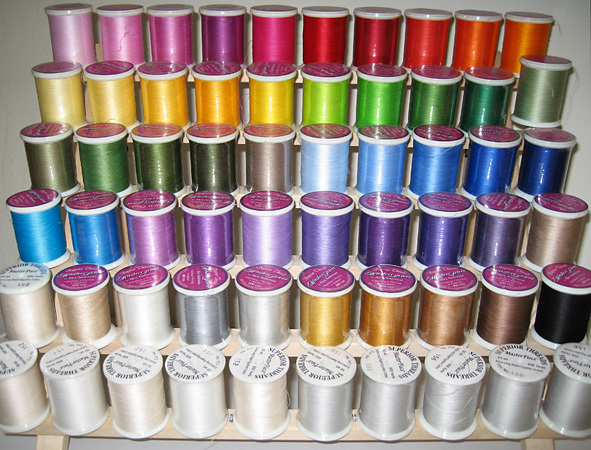 Thread, thread and more thread!! 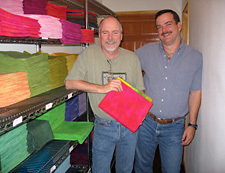 Meet Bob and Heather Purcell of Superior threads as they share the ins and outs of thread today. 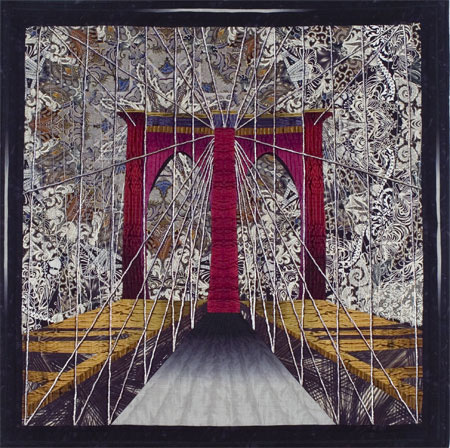 How I have fallen in love with Superior Thread, especially Master Piece (although I am a bit biased). 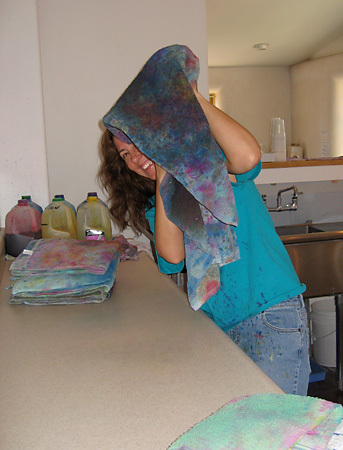 It is splendid for machine work, plus look at all the delicious colors! 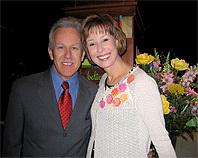 Please visit Bob and Heather’s site at www.superiorthreads.com and be sure to sign up for the news letter. 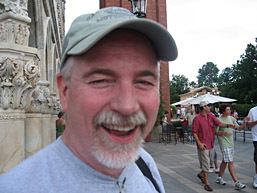 As mentioned in the episode, it is filled with excellent information for you to enjoy and always a good joke. Also, be sure to see if Bob is coming to your area for a lecture, it is excellent. You will learn so much and probably return a time or two. 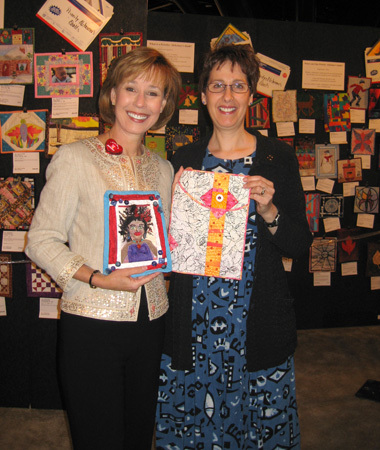 Meet Karey Bresenhan President of Quilts Inc. and director of the International Quilt Markets and Quilt Festivals. This is a delightful candid interview with the driving force of what we are enjoying today in the wonderful world of our quilting experience. 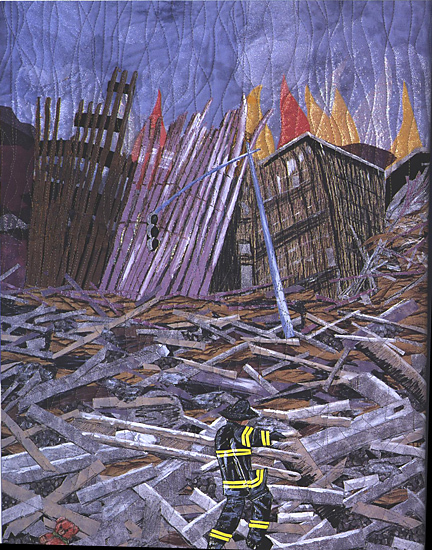 Karey Bresenhan, President of Quilts Inc.
Our hearts were broken Sept. 11th 2001. 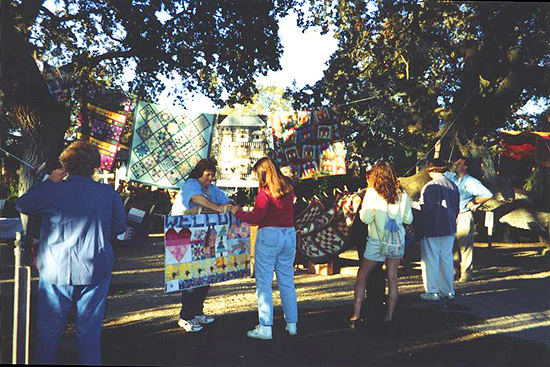 Karey added a venue at the Houston Market and Festival (6 weeks later) where quilters could express their pain, emotion, hope and pride in this stunning exhibit. 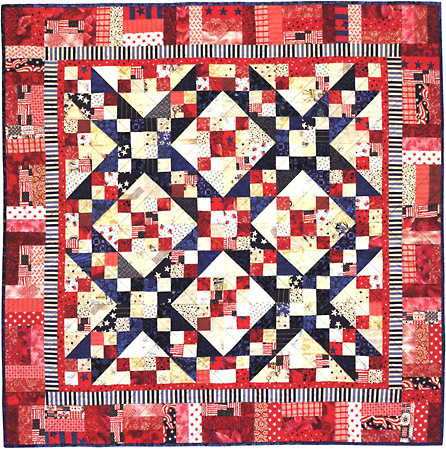 This quilt was made by Erlene Irwin of Lexington, VA. All the quilts can be seen in Karey’s book, America from the Heart (available on line at www.quilts.com). 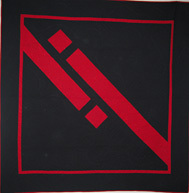 Celebrating traditions and norms of a subculture. Stepping into the uncomfortable until we become at home. My staff relaxing with her favorite toy. 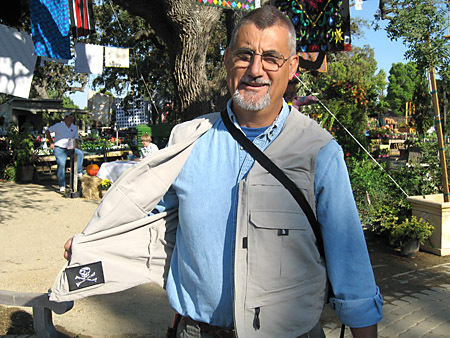 Pirates rrrrr cool even under a cowboys arm. 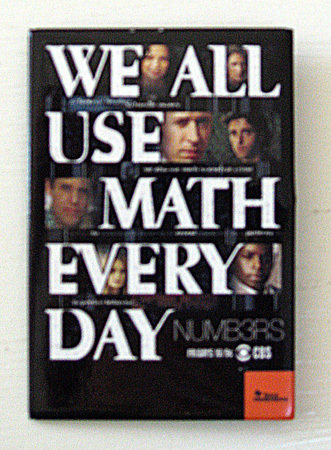 We all use math every day! 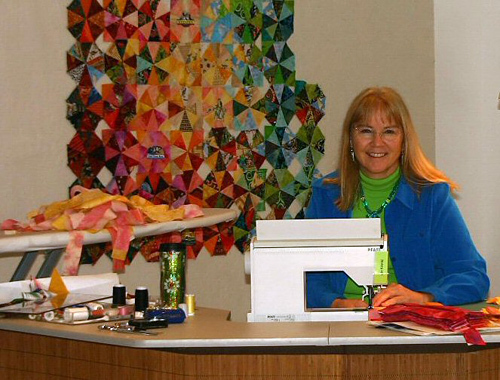 Meet Editor in Chief Patricia Bolton, a dynamic force and delightful spirit who created Quilting Arts magazine and Cloth Paper Scissors. 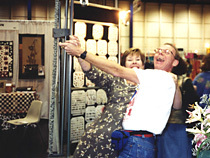 Pokie and John Bolton enjoying time together, both at work and play. 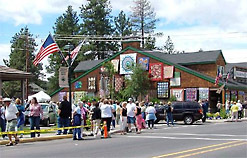 The Alden Lane Quilt show is gearing up for another wonderful show. 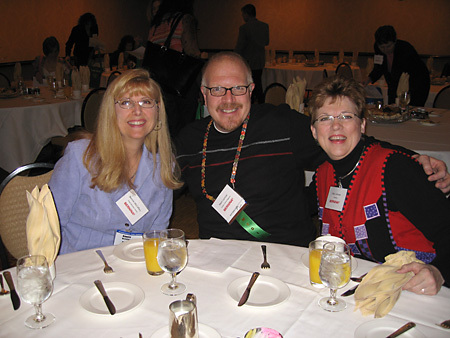 Cyndee Carvalho, general manager, takes time from her busy schedule to join us. Learn the details of this years show (it’s going to be GOOD) and hear some of the tales of behind the scene. 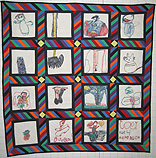 Check out In Between Stitches at www.inbetweenstitches.com/about.htmGarden Hilton 925-292-2000If you would like to volunteer to help with hanging the quilts or take down, please email Cyndee directly at cyndee@aldenlane.com . 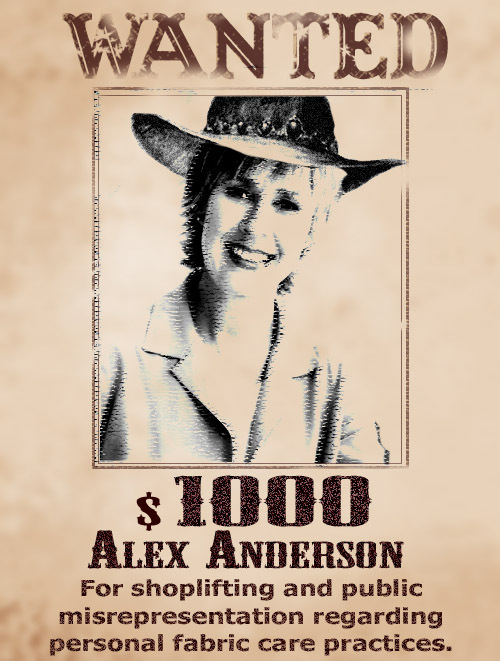 Please let her know if you can help with morning (7:00 am sharp) or take down (4:00 sharp). Please specify Saturday or Sunday. Also, leave her your phone number. 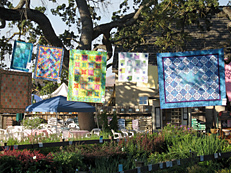 Alex and Bernina join forces and contribute to McCall’s Quilt magazine for the next year. Each issue will have a 1/3 page article to be complimented with a special web site and a special on line radio episode. First topic, Explore and Discover new quilt ideas. 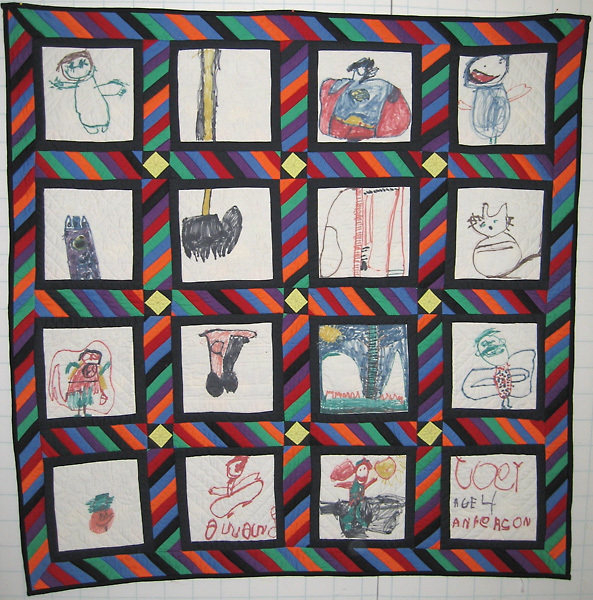 Check out Joey’s quilt he started at age 4. 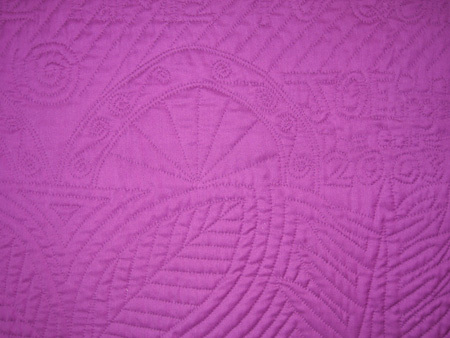 The close up shows Adair’s hand print stitch right into the quilt top. 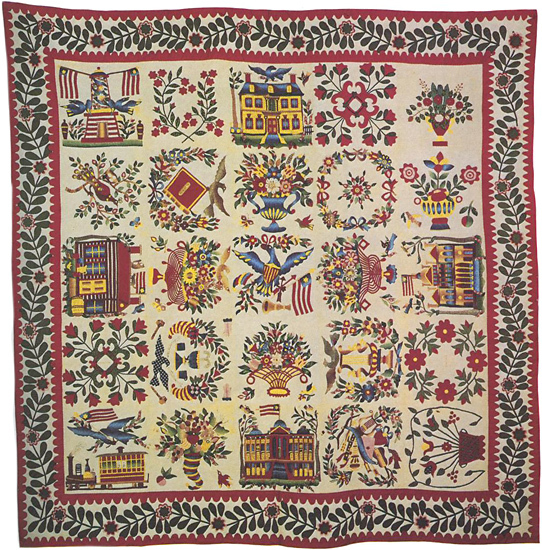 this quilt is a true family treasure. 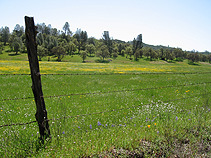 The vibrate colors of spring nestled in the hills above the Livermore Valley. 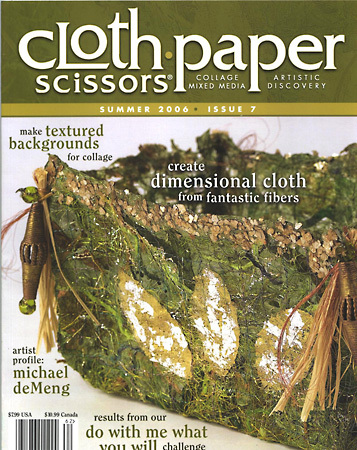 Ask your local quilt shop for a copy of McCall’s Quilt Magazine, August 2006. 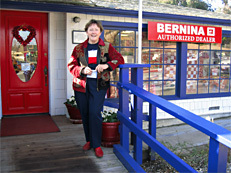 Please visit www.BerninaInspirations.com for more information, inspiration and ideas to enhance your creative experience. 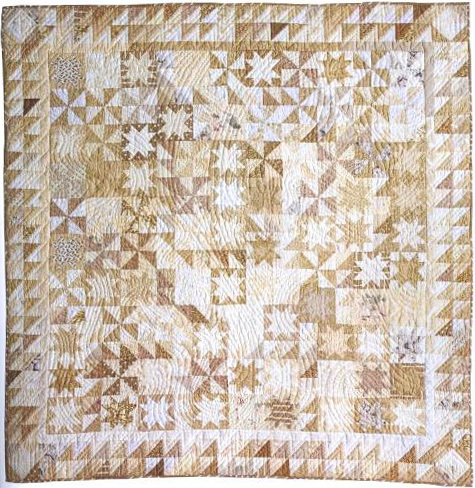 A step back in time, an interview with Lindy Miller celebrating the pioneer spirit, piecing our countries quilting history together. Martin and myself the day at Bernina University when it was announced I was on board. You have to love Martin’s out fit! 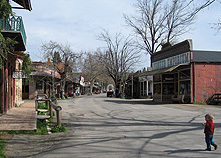 BU was held in Texas that year and Martin came in riding a white long horned steer (ask any dealer about the year he was Dorothy in Kansas). I was sitting in the front row and realized I was a moment away from being a shish ka bob on the bull’s horn. It has been a blast ever since that fateful day! 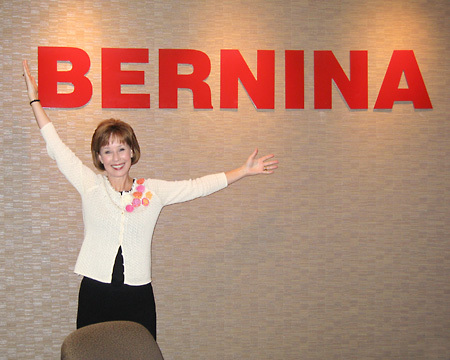 I love Bernina and always find myself at home in Aurora, IL. 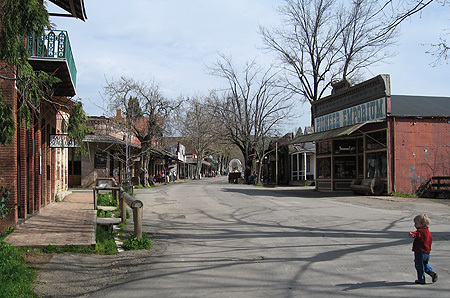 Enjoy a photo tour of the past few years. 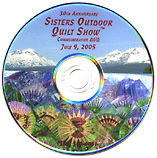 For a fun quilt treat or quilt gift, this DVD is a must see. 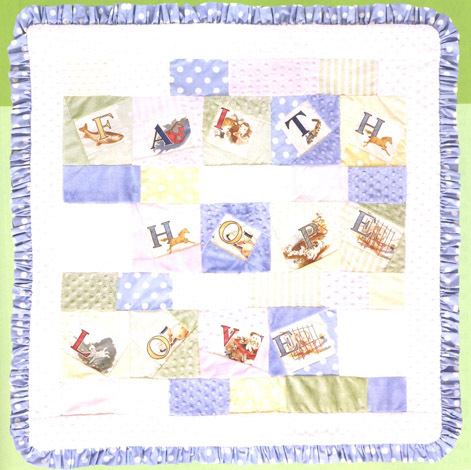 To order call The Stitchin Post at 541-549-6061 or visit their site to order. 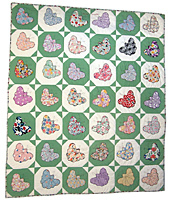 For the love of a thimble, an understanding of the basics of hand quilting. 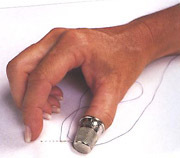 Quilting away from myself with the thimble on my thumb. 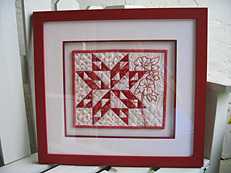 Simple but effective quilt frame. For the past few months I have been off and running to various quilting venues, with the last gig being an exceptional moment in my quilting career. 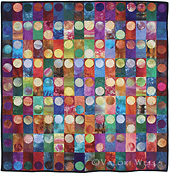 Here is a quick quilt catch up for a gal on the run, and that would be me! 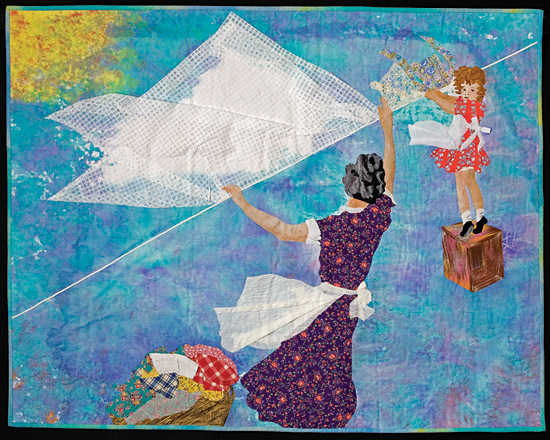 The beautiful work of Virgie Fisher. My wonderful class at festival. 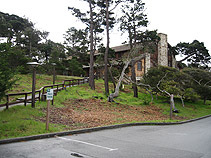 Asilomar, California provides the perfect setting for a five day seminar. Nancy Smith and Lynda Milligan, friends and owners of Great American Quilt Factory in Denver Colorado. 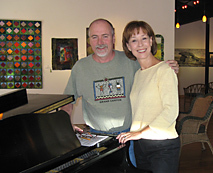 John and I out for an evening of art and inspiration. Notice how the flowers relate to the art piece in the back left hand side of the picture, inspiring! 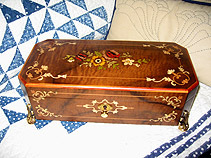 www.aldenlane.comPlease visit Ellen Anne Eddy’s web site to see her wonderfully creative work. 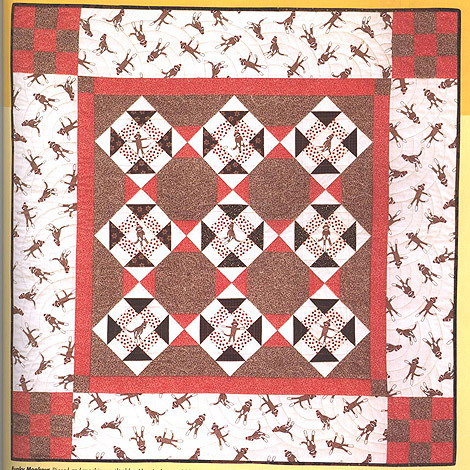 Batting – It’s all in the guts of the quilt. 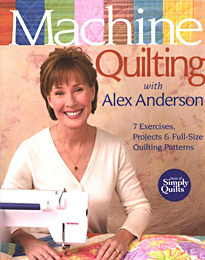 To learn more about Hand Quilting you can order my book online. I would be happy to autograph it for you. 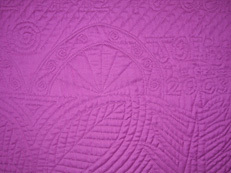 Fluff and Stuff, Keys to successful machine quilting. A visit with machine quilter Paula Reid. 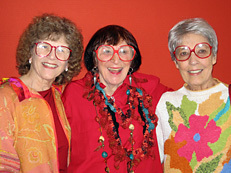 Paula has generously offered one free pattern with your order of a DVD. Simply mention our podcast and specify which pattern you want in the NOTES/COMMENTS box on the checkout page. 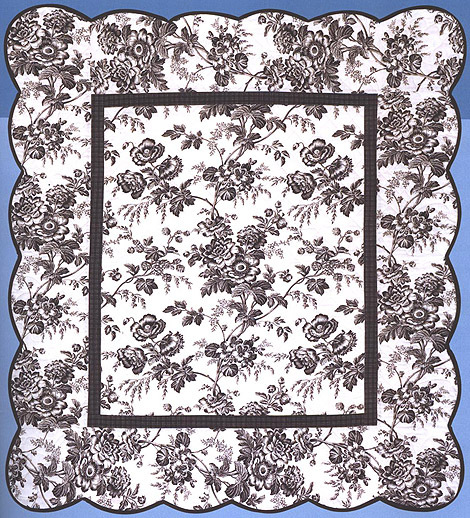 DO NOT ADD the free pattern to your cart, as you will be charged for it. Oh Baby, let’s wrap our new born’s in love. 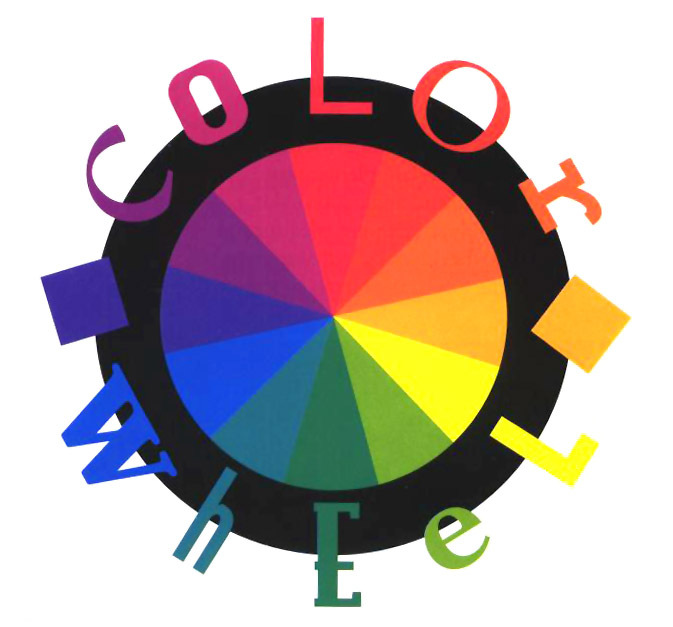 Understanding authority, coming to terms with the color wheel. 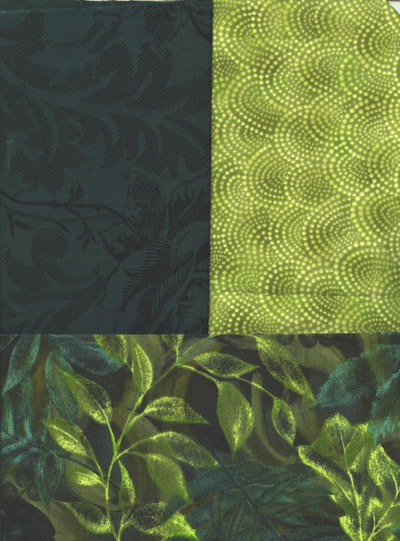 Color bridge green fabric brings two unlikely playmates together. 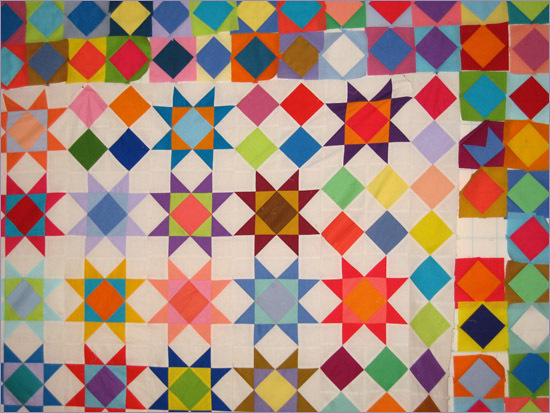 Add sparkle to your quilts. 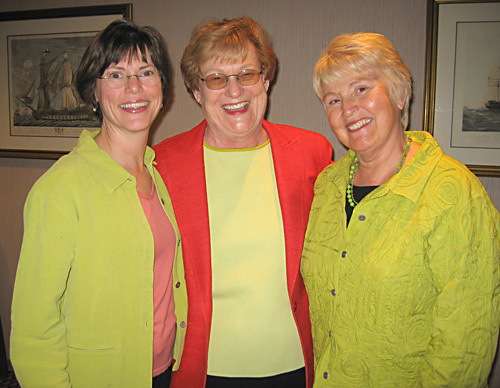 Check out the blue blouse, remember that color a few years ago? Jail Time : After the show, post script to program two. 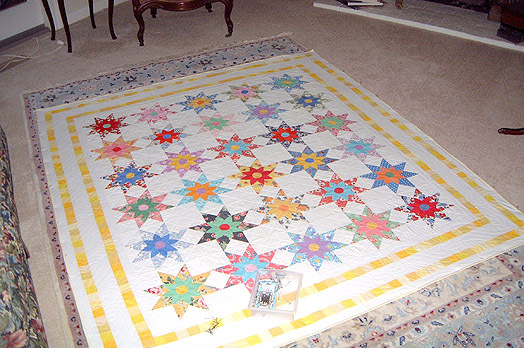 Star Garden whipped into shape and blocked on the floor. 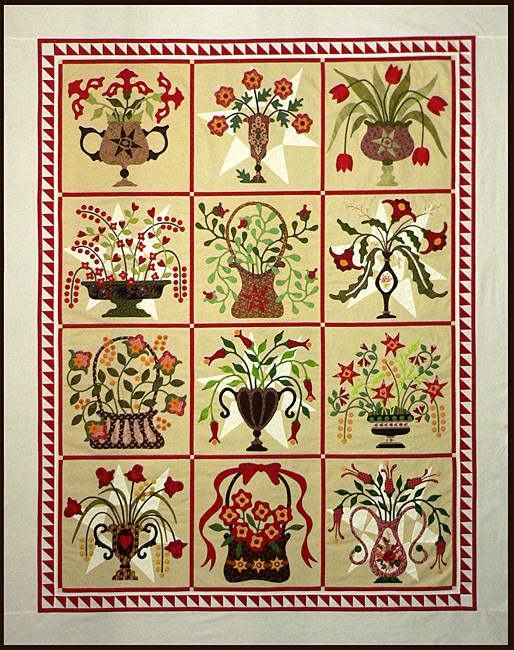 This quilt pattern will be available spring ’06 (JWD Publishing http://joenwolfromdesigns.com ). 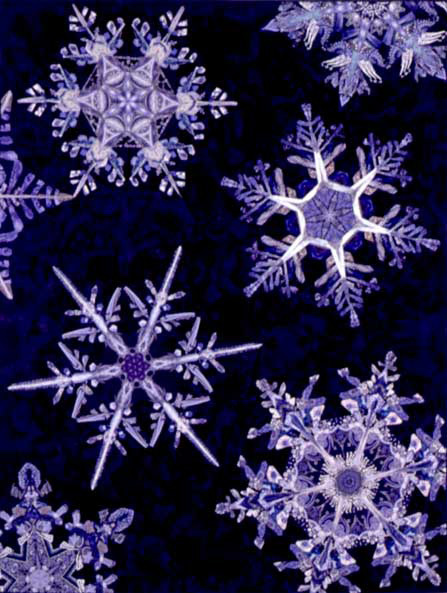 Working with holiday theme fabric and to pre wash or not to pre wash, that is the question. 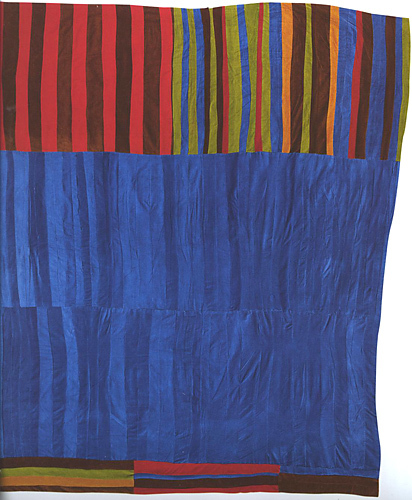 Notice how this patriotic color combination becomes visually confusing with all novelty prints. Using only a few patriotic prints along with tone and tone and sparkle fabrics give the eye a place to rest. 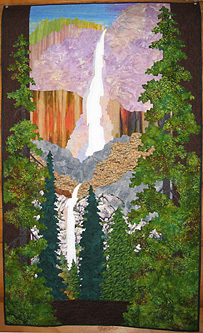 Road to California quilt from the book Fabric Shopping with Alex Anderson. 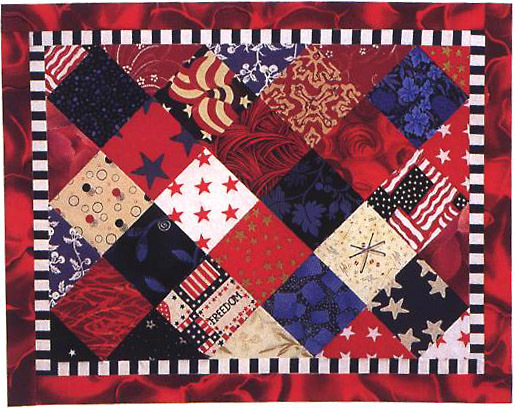 This example illustrates how to get a smashing 4th of July quilt using only a few patriotic prints. 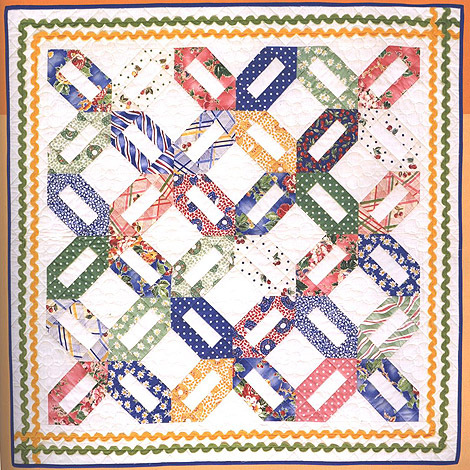 The pattern for Mud is available in Beautifully Quilted by Alex Anderson. 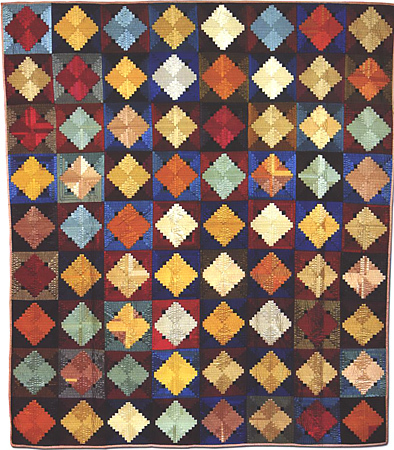 Simply Quilts personal reaction, memorable guest and color challenge.